A student from the Kyrgyz Republic who police charged in defacing the Lincoln Memorial in September did not make his court date because he is in Russia. WASHINGTON — A student from the Kyrgyz Republic who police charged in defacing the Lincoln Memorial in September did not make his court date because he is in Russia. U.S. District Court records show that 21-year-old Nurtilek Bakirov was ordered to leave the country in late September as his visa was about to expire. However, when he tried to re-enter the U.S. from Russia, the State Department denied him entry and denied issuing him a new visa, court records said. Bakirov is currently in Kerch, Russia, the documents said. 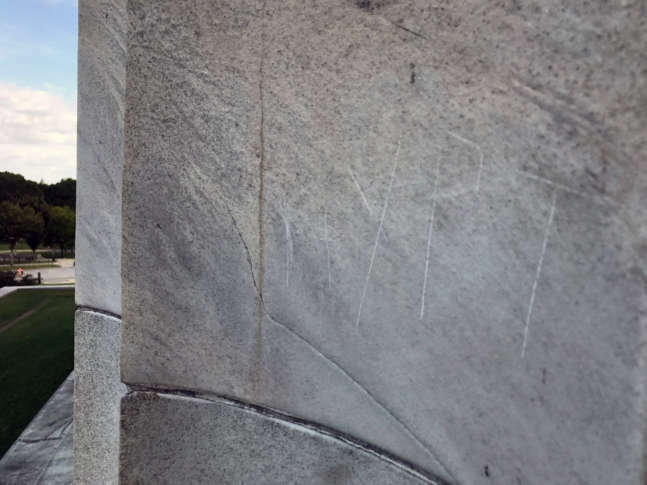 He is charged with felony malicious destruction of property and faces 10 years in prison after a U.S. Park Police officer found him using a penny to carve letters into a column of the Lincoln Memorial. A judge released him on his own recognizance after his initial hearing on Sept. 19. The government counsel will work with the State Department on his re-entry, the documents said. His court date has been rescheduled for Nov. 30.